As I’ve mentioned before, there were many inventive and wild ideas as to what would be at the north pole. Inventio Fortunata, meaning “fortunate, or fortune-making, discovery”, is a lost book dating to the 14th century-ish. It contains a description of the North Pole as a magnetic island surrounded by a giant whirlpool and four continents. 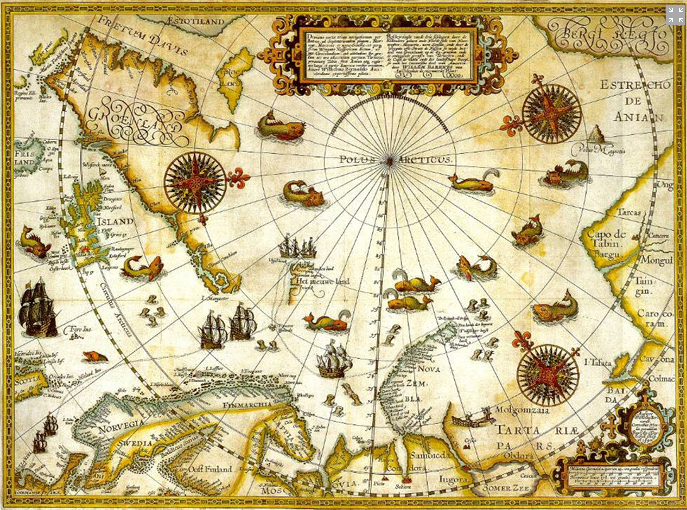 No direct extracts from the document have been secured but its influence on the overall Western conception of the geography of the Arctic persisted for several centuries. The Hollow Earth theory was also enormously popular as a theory (and, apparently, is still believed by some). An idea first appearing in ancient history, this theory of a world internal to ours and accessible only at the poles was popularized by a number of 18th and 19th century scientists and philosophers, notably John Symmes and Jeremiah Reynolds, one of his followers. Reynolds pushed for an expedition to confirm his theory under John Adam Quincy’s administration, but shortly Andrew Jackson came into office the idea was dissolved. Reynolds did end up making it to the shore of Antarctica using privately raised funds, but the ship was quickly turned around and Reynolds deposited in South America when his crew mutinied. The Ancient Greeks believed a people called the Hyperboreans lived at the pole in a paradise that could not be reached by other men (not to be confused with Hyperborea, the planet of He-Man). There they lived in the woods without fear of the weather, never had wars and grew to be a thousand years old. When they became tired of life, the Hyperboreans put on a garland of flowers and fell from a cliff into the sea. The Greeks were a bit unique in this Eden-like conception of the pole, although there were those 18th and 19th century minds that supposed a temperate land or open ocean could be found at the pole. Some even went so far as to say that the Pole could be where man first originated, literally a possible location for Eden. 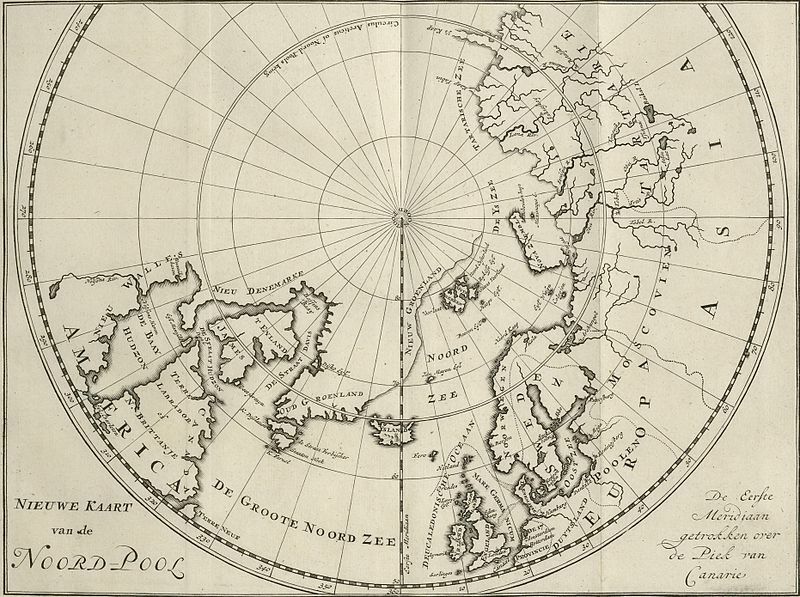 This map of the known northern arctic dates to about 1720 and comes from the “C.G. Zorgdragers Bloeyende opkomst der aloude en hedendaagsche Groenlandsche visschery”, which as far as I can tell with my use of google translate is a book of maps and resources for whalers based in and around Svalbard and Greenland. As you can see, the majority of the arctic was still totally unmapped even to the northernmost-going peoples, the whalers based out of Greenland and Svalbard. Bonus map! This one’s a personal favorite. This 1599(ish?) map by Dutch explorer Willem Barentsz mapped Spitsbergen (the largest island in the Svalbard archipelago) for the first time. It’s labelled here as Het Nieuwe Land, which is Dutch for “the new land.” It’s also a beautifully illustrated map. No Hyperboreans, but look at all the adorable whales! Wonderful.